Akos from the rtlsdr4everyone blog has been busy uploading new posts over the past few days. His first post is part three in a series that discusses how to avoid ripoffs when buying RTL-SDR dongles. The RTL-SDR market has recently become quite saturated, and it is now easy to purchase something that most experienced users would consider a ripoff. His post shows some examples of what he considers to be poor value choices available on eBay. An example of a ripoff price. His second post discusses his methodology for testing dongles on their ADS-B performance. 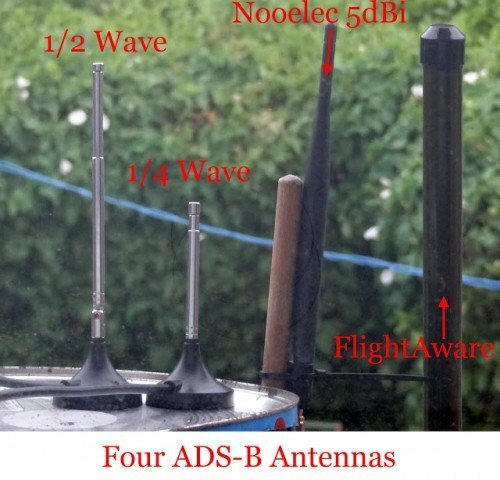 The second post then leads into the third post in which he compares four antennas on ADS-B reception. He compares two telescopic whip antennas, one set to 1/2 wave length, and the other set to 1/4 wave, a NooElec 5dBi whip antenna, and the FlightAware ADS-B antenna. His results show that the FlightAware antenna was the best performer, followed by the 1/2 wave telescopic whip, then the NooElec 5dBi whip and finally the 1/4 wave telescopic whip. The fourth post continues the ADS-B topic, and he reviews the NooElec 5dBi ADS-B antenna. Although the performance is not as good as the FlightAware antenna he mentions that it is much smaller and great for portable use. If you are interested, we have also a review of the FlightAware antenna, and we also found its performance to be excellent. The four ADS-B antennas tested in Akos’ review. In his fifth post Akos shows what his RTL-SDR travel kit consists of. In this post he recommends both our RTL-SDR V3 dongle as well as the NooElec SMArt. For a portable computer, he takes along a Raspberry Pi 3 and a 20,000 mAh battery bank with solar charger. 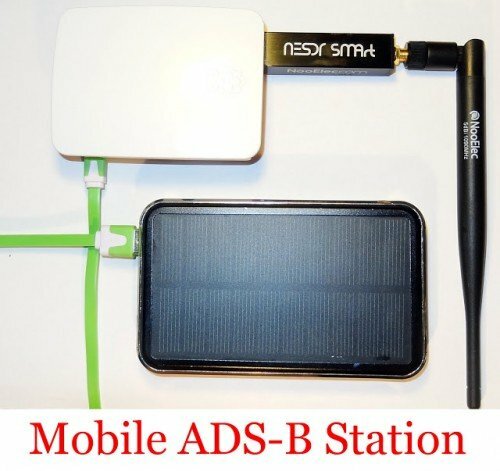 (Though we’d be interested to hear from Akos how long it takes for that small solar panel to charge the battery bank, probably takes days to charge?) For antennas he prefers to take along our large 1.5m telescopic antenna, the NooElec 5dBi ADS-B antenna, a medium telescopic antenna and a Nagoya knock-off telescopic antenna. Finally in the sixth post he shows a video that compares the differences between a generic dongle modded with direct sampling (without any impedance matching circuitry), an RTL-SDR dongle with ham-it-up upconverter and an SDRplay. Unsurprisingly the upconverter and SDRplay performs best. As a bonus, Akos also has done an interesting stress test on the metal case of our RTL-SDR dongles, where he runs it over with a bus to see if it will survive. The case is mangled afterwards, but the dongle and functionality survives! Great post regarding ripoffs, Akos. Here’s a few others of note: Once saw one a dongle on a major auction site selling for $310! But shipping was free. Yeah, right! I sent him a note asking why the high price, never answered me. One other time on the same site a seller was advertising a $0.01 selling price for a dongle – that’s right, a dongle for only one red cent – but wait, read the fine print – shipping was $87.00! These types of ads are a continuing source of amusement if anything. I thought Ebay was going to crack down on those penny deals with hundred dollar shipping, but I haven’t seen much progress. At least the pawn shop in town that gives a free guitar with every $14.95 guitar pick also provides a few chuckles too. The extra shipping charge scam was explored in previous ripoff post, but it’s still around. I saw the RTL dongle in the picture and I have One big question ???????????????? Does it still work ?????? Never mind I just read the caption .